Outdoor lighting is a great way to add some pizzazz to your home. Even the most elegant home can disappear into the dark without outdoor lighting. So when you make the decision to install outdoor landscape lighting for your home, you are making an investment. Like any investment, you want to make your outdoor lighting system last longer. When you put in time and money for a gorgeous outdoor lighting system, only to be plagued with failing fixtures and constant repairs, you can feel downright cheated. Imagine if another part of your home—your refrigerator, your windows, your plumbing—started to fall apart after just a couple of years. You would be livid. Unfortunately, that’s what happens to many outdoor lighting systems. They look great at first, but after just a couple of seasons, they start to show their age. To make your outdoor lighting system last longer, all you need to do is start out with the right priorities. Keep in mind the quality of your components and the abuse each piece will take. You wouldn’t install a roof that isn’t suited to your climate. So why would you install an outdoor lighting system that won’t survive its environment? At Night Vision Outdoor Lighting, we want you to enjoy your outdoor lighting for as long as possible with as few repairs and as little maintenance as possible. It all starts with the right installation. That’s why Night Vision Outdoor Lighting is your best bet to make your outdoor lighting system last longer. In this part one of our two-part series, we will look at the most durable outdoor lighting fixtures. In part two, we’ll take a look at other factors that influence the lifespan and durability of your outdoor lighting system. The most visible part of your outdoor lighting system is the collection of fixtures that together make up a lighting system. You will likely have a variety of fixtures: wide angle lights for your facade, bullet lights for trees and architectural features, path lights to keep your walkways safe, and more. Some of these fixtures are meant to be seen, while others should be as hidden as possible. But whether or not you can see a fixture, investing in a high-quality, durable fixture will make your outdoor lighting system last longer. The first concern with any fixture is its construction. What is it made of and how well can it stand up to the forces that nature and people throw at it. 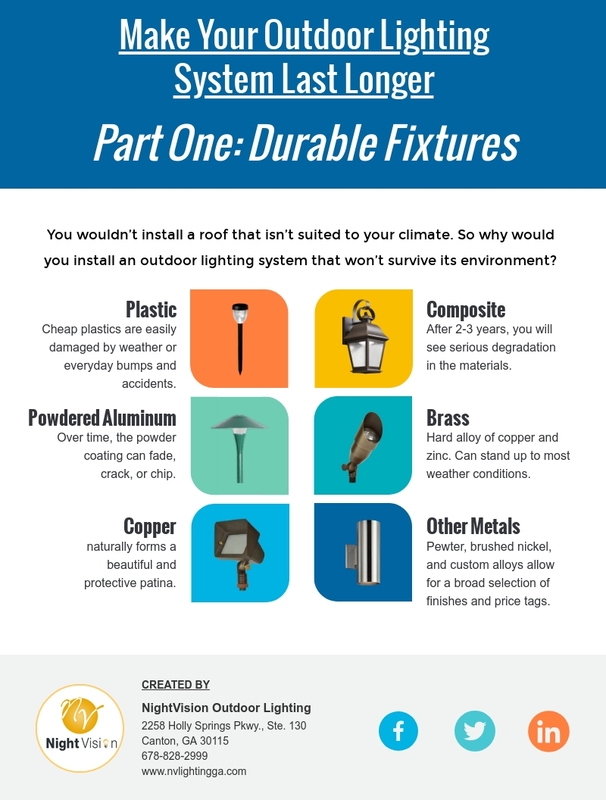 Most fixtures need to stand up to rain, wind, and other severe weather. They may also have to stand up to sprinklers, occasional lawn mowers, and other man-made hazards. The material your fixtures are made of, and the quality of their construction are the most significant factors in their durability. The cheapest fixtures are made of plastic. You’ll find these low-cost fixtures in big box stores and hardware stores. Often, these low-cost low-quality fixtures have built-in solar panels to generate the energy to power the bulb, without the need for separate wiring. 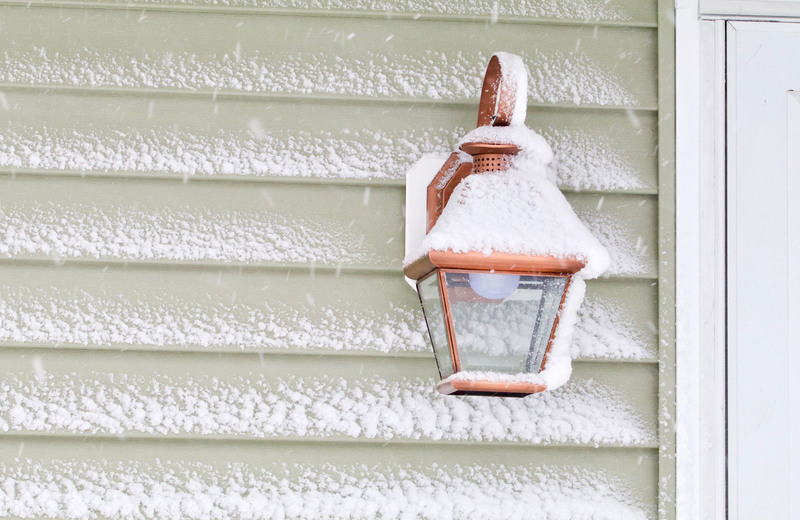 Night Vision Outdoor Lighting suggests that you stay far away from these fixtures. Their price is directly correlated to their quality. Cheap plastics are easily damaged by weather or everyday bumps and accidents. Solar-powered lights are rarely bright enough, and the cheap solar panels wear out quickly. These fixtures will definitely not make your outdoor lighting system last longer. Instead, they will end up costing you more as you constantly replace broken and worn out lights. Composites are still technically plastic, but they are stronger than the cheap plastic in the lowest-cost fixtures. These fixtures are usually powered by buried 12-volt wiring. Their main attraction is their price. Composite fixtures are the lowest-cost fixtures besides the low-quality big box store sets. However, composite is not the most durable material, either. After two or three years you will notice serious degradation in the materials. The fixtures can become splotchy with stains and fading from weather and sunlight. The materials can also become dry and brittle, and even crack. If a fixture cracks, it can expose the bulb to the elements, and you can be stuck with a broken fixture and a bad bulb. If you value upfront savings over long-term durability, you might choose composites. However, Night Vision Outdoor Lighting wants to warn you of the short life expectancy of composite fixtures. Aluminum fixtures are the cheapest metal fixtures on the market. They are not as durable as other metal fixtures, but they have some advantages over plastic and composites. If you are buying aluminum fixtures, make sure the aluminum is powder coated. Besides giving the aluminum a beautiful color finish, powder coating seals the metal and helps protect it. However, even powder coated aluminum is highly susceptible to the sun’s UV rays. Over time, the powder coating can fade, crack, or chip. Aluminum fixtures are also more likely to become dented than other metal fixtures. However, for a lower-cost system that won’t see extreme weather conditions, aluminum can be a good compromise. But beware, if you live in a coastal area with salty sea air, aluminum will corrode quickly. Brass is an excellent material for outdoor lighting fixtures. It is a hard metal alloy of copper and zinc, and it can stand up to most weather conditions. Brass doesn’t dent easily and won’t be damaged by corrosion. Depending on its finish, brass may also develop a patina over time. Technically, patina is a form of corrosion. But instead of degrading the material, patina forms a protective oxide layer that prevents further damage and makes your outdoor lighting system last longer. The patina will usually produce earthy tones which can go well with your landscaping. If you prefer to maintain the bright look of new brass, you can get brass fixtures that are treated to prevent oxidation. Because brass is a more expensive material, brass fixtures are more costly than aluminum. One benefit, though, is that brass fixtures are also usually built to a higher standard of quality. The brass fixtures are an investment to make your outdoor lighting system last longer. But they may end up saving you some money and a lot of trouble over the many years they remain intact. Copper is not a cheap metal, and copper outdoor lighting fixtures come with a price tag. However, there is a wide range in the cost of copper fixtures. Some fixtures are available for under $50, while artistic and handmade fixtures have no upper limit to what you can pay. Like brass, copper naturally forms a beautiful and protective patina. We love copper for its unique look and long lifespan. Besides brass and copper, a wide range of metals is used in outdoor lighting fixtures. Many of them are quite durable. Materials from pewter to brushed nickel to custom alloys allow for a broad selection of finishes and price tags. In general, Night Vision Outdoor Lighting always recommends the use of metal over plastic or composite, and almost any metal is better than aluminum. However, each material and each fixture is unique. One of the best ways to judge a fixture’s durability is by its ingress protection rating (IP rating). Ingress protection is how well a fixture can keep out dust and moisture. A higher IP rating means your bulbs are better protected and will burn out less quickly. The IP rating is made up of two digits. The first digit denotes how well the fixture keeps out dust and is measured on a scale of 0 to 6. The second digit denotes how well the fixture keeps out moisture and ranges from 0 to 8. For example, an IP rating of IP53 would mean that the fixture is great at keeping out dust, but not so great at keeping out moisture. An IP rating of IP57 would indicate that a fixture is highly resistant to dust and moisture. Using fixtures with a high IP rating is one way to make your outdoor lighting system last longer. If you’re wondering about which fixtures to use, Night Vision Outdoor Lighting can help. We will include our suggestions for fixtures in our customized system design, and the cost will be rolled into your estimate. Because we purchase our products in bulk, we can often get better prices than retail, and we pass those savings right on to you. If you’re ready to start building your unique lighting system, contact us today for your free consultation. NOTE: Keep an eye out for part two of this series. We’ll discuss other factors besides fixtures that can make your outdoor lighting system last longer. While fixtures are important, the type of bulbs you choose and how your system is designed, wired, and installed are also significant factors in your lighting system’s long-term durability.